Second edition with updated text and 8 extra pages. 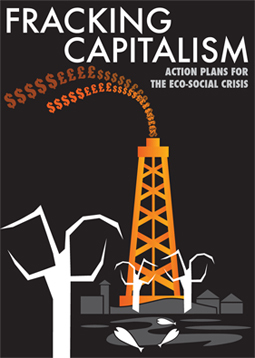 Exposes what’s behind the corporate-state plan to frack Britain and what we can do about it. Penny Cole, Matt Worsdale, Gerry Gold and Donald McQueen. Edited by Paul Feldman. With colour photos of the Balcombe struggle by Peter Arkell. Widespread hydraulic fracturing – fracking – for shale gas threatens large areas of rural Britain with unimaginable industrialisation and pollution of air and water. When it comes to the planning process, the system is weighted heavily in favour of fracking companies. Local authorities have little room for manoeuvre in the wake of current law and government “guidelines”. Communities are uniting across the world in actions aimed at thwarting the shale gas corporations and exposing the anti-environmental consequences of their operations. A web of connections stretching from corporations, to lobbyists, through to ministers and to departments of state ensure that the business of government is business itself. Britain is not so much a democracy as a corporatocracy, where the interests of companies are deemed synonymous with those of the state. Contrary to government and industry rhetoric, shale gas will actually increase global greenhouse gas emissions. This can only intensify the climate change crisis that the Intergovernmental Panel on Climate Change described in great detail in its 5th assessment published in September 2013. The rapid adoption of fracking to obtain gas or oil, and the reaction it is provoking before things get under way in Europe, contains all the elements of an extreme economic, ecological, social and political crisis with a common underlying cause. Slowing, then halting, global warming requires an immediate reduction in the quantity of fossil fuels burned. The major question facing humanity is: can we rely on the existing governing structures to make this happen? The evidence against is clear enough.